Let’s face it, pretty much everyone likes watching shows about home renovation and the like. There is something in the brain that flips, usually around your 30s, that makes us all real-estate obsessed even if it’s not something we broadcast and pretend our family members are the ones who leave HGTV on all the time. 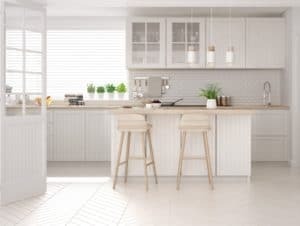 Of particular fascination is the ability to transform a “Fixer-Upper” into a stunning home that could be the envy of the neighborhood, or at least a really nice place to live. So when you came into possession of an extra house, perhaps as inheritance, a “gift”, or because you just moved out of it for an even better home, it seems like the perfect opportunity. You and your buddies will get to do your very own episode of Flip This House or Good Bones. But it’s a lot more complicated than you might think. Not only do houses chosen for these shows go through an audition process for ‘suitability’, they also have all the expertise, help, and budget that Hollywood can provide. The first step to a successful flip is getting absolutely everything that is not structural out of the house. Every pile of old junk in the closets, basement and attic. Every square-foot of clothing (you know what we mean) and every heavy, cumbersome piece of furniture. Not to mention the semi-essentials like curtains, wall decor, throw-rugs, etc. etc. etc. For some homes, this is easy. You may have even lucked out and been blessed with an already empty home, except for the few lingering gems in the attic. There’s always something forgotten in the attic. However, if you have inherited a relative’s house that is still full of their life’s possessions, from heirlooms to cat-sweater collections, or if your old house is still full of all the stuff you didn’t take with, this can be a surprisingly taxing ordeal. Truly emptying a house that has been accumulating stuff for decades can take weeks. And it’s only the beginning. Oh, and don’t forget that to renovate, you’ll also need to remove the appliances. Think washer/dryer, fridge, stove, dishwasher. Which means uninstalling them and reinstalling them when you’re done. Do you know what the vast majority of HGTV flipped homes don’t have? Unbelievable extensive mold behind the walls or in the carpet padding. Termites eating at the structures and a foundation that cracks and is slowly pulling the house apart. Only the shows tailored to those of us who like a little horror in our real-estate drama even hint at these terrible structural flaws that can stop a flip dead in it’s tracks. Flip or flop? When it comes to mold, termites, foundation problems, massive water damage, and similar issues, it is always going to be a flop. It’s not that the house doesn’t have potential, or that remediation and repair isn’t possible. It’s that suddenly “A few coats of paint and replacing those 70’s era floors suddenly turned into tens if not hundreds of thousands in simple recovery processes. And in case you didn’t know, mold inside the drywall means you’re going to need all-new drywall. In DIY home flipping shows, your main characters and their support teams always seem like nice, average people who suddenly manifest super-human home rebuilding capabilities. How many times have you seen sped-up and time-lapsed clips of these people miraculously building new structural features, installing beautiful new floors, or reinventing the plumbing and lighting fixtures to transform a house from dud to dream home? Well, we hate to break it to you, but you and your buddies are not going to manifest these master-builder skills overnight. Unless you have a history in construction or have done a lot of flipping-style projects in the past, it takes time, effort, and a decent amount of learning from mistakes to lay a perfect new wood-panel floor, install a fancy light fixture (safely) or significantly change built-in aspects of a home. Amuse yourself for a moment by checking a few DIY fails on Pinterest to get an idea of just how hilariously bad it can go when amateurs take on projects that TV pros make look easy. Before you pick up the power drill. Okay, so you’ve accepted that maybe you’re not the right person for some of the flipping job and have started to think about hiring contractors for at least part of the project. This is a great idea, in theory, but you are essentially creating a new home renovation project with all the ups and downs that this endeavor traditionally entails. Just to hire contractors is a big ordeal. You need to find a trustworthy team with the right skills. You need to make sure the contract protects you from contractor mistakes and faulty materials. And you need to prepare yourself for some serious sticker-shock. Hiring an HGTV-worthy construction team costs a lot more than you think it does, and final costs are almost always higher than the estimate. 5) The Time it Takes! We mentioned sped-up clips and time-lapse videos before in passing, but now really stop and think about it. Exactly how many days does of fully dedicated labor does it take to flip a house? Even with the shows that emphasize working quickly – how many energetic, professionally trained young people are really working on each project? Flip on your favorite renovation show and actually count them. Including all the people in t-shirts in the background doing the painting, prep, and finishing work. Now count your team, the hours you have to dedicate during the week and weekends, and how much of your free time over the next year you really want to pour into this project. Even if you do have all the skills necessary to take on your envisioned renovations, the amount of time it will take can boggle the mind. This is why so many home renovations go half-finished and why many people who DIY have ongoing projects that never seem to end in a beautifully complete home. Finally, let’s say you do put in the time, have the skills, and manage to complete every renovation you feel is needed to sell the house. You even reinstall the appliances or go the extra mile and replace them with new ones. Believe it or not, you aren’t done yet. The next phase of the project is actually trying to sell the house. If you’ve never sold a house before, or only sold one that was already officially ‘market ready’, then brace yourself once more. Because buyers make demands. You find a great couple who “Love” the house except… before they sign the contract, they need you to fix X, Y, and Z. Sure, they adore the cozy home you’ve renovated and would love to pay you a hundred thousand dollars or more. But they actually hate the new tile backsplash you put in and need it replaced. Or they could only live in a home with a glass-top stove. Or the classic wallpaper in the stairwell you thought was good enough to keep simply has to go. Back to the DIY drawing board, hire contractors, or throw up your hands and let the place stand vacant after all your hard work? Fortunately, there’s a better way. If you’re having second thoughts about a DIY flip but know that the house needs more than a little TLC before it’s ready to be someone’s new “Dream Home”, don’t despair. You can still get a good price without all the dedicated time, elbow grease, and pizza bought for helpful friends. Let us buy your house as-is and our HGTV-worthy teams here at Seller’s Advantage will take care of the rest. You get a good price, no DIY disasters, and you don’t even have to put up with realtor hassle and fees. And we get another great property that someone will love! For more information or to get a no-cost, no-strings assessment of your property, contact us today!